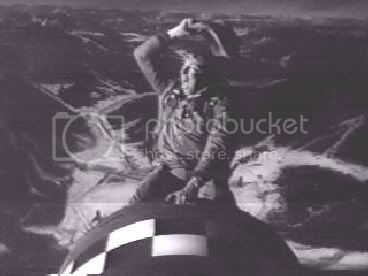 Major T.J. 'King' Kong from Dr. Strangelove rides again, personified by the 21st century crop of useful leftist idiots. Like the most histrionic of narcissists they can't help drawing attention to themselves and the fact that they operate on about the same moral level as a Saddam Hussein. Without a care in the world--except, of course, for the villainy of the imaginary BushHitler--a product of their fevered imaginations--they are pleased to laugh and whoop it up as they ride their bomb down to the ultimate destruction of civilization. Isn't it ironic that in the movie, Slim Pickens' character was mocked because he enthusiastically exemplified all the right-wing ideologues of the day, supposedly hellbent on destroying the oppressive evil that was communism--real evil that resulted in the deaths of millions. Now, fast-forward to today. The political left is hellbent on destroying our own country and its values by supporting and enabling the new generation of oppressors, and they are the ones who sit atop the weapon of mass destruction aimed at the heart of civilization. They are so twisted and warped, that many don't even understand the nature of the suicide/homicide mission they have been sent on by the intellectual elites that control their thinking. On the contrary, just as all the brainwashed, fanatical suicide bombers that came before them, they believe that their actions are for the 'greater good'. That is why they are visibly and vocally outraged at the execution of Saddam Hussein for crimes against humanity; but have little to say about the victims of Saddam. Truth be told, they never have anything to say about real victims, unless it serves their own narcissistic agenda. Take a look at one of the most egregious useful idiots of all time who leads the pack in blaming--who else?--America and Bush for Saddam. Just browse the left blogosphere to see how their ideology easily deflects them from having to confront real evil in the real world. (see Radio Equalizer for a roundup of some of the left's dismay--but there is plenty out there he hasn't got around to listing). There are no voices from the left for the victims of the Janjaweed any more than there were voices from the left that spoke out for the victims of Saddam. There are no voices from the left decrying the Iranian mullahs repressive regime and their support for terror. There are no voices castigating the Saudis and their bigotry and more than there were voices from the left that spoke out about Taliban bestial behavior in Afghanistan.The fear, intimidation and murder that is a hallmark of the Allawite regime of Assad clan is ignored as is the pornographic behavior of the Palestinians, masquerading as a civilized society that is equivalent to the society the Israelis have built. The true (im) moral center of the left is exposed every time the perpetrators of the evil or genocide are brought to justice. One of the definitions of justice is “conforming to truth, fact, or reason” and, as a psychiatrist, I like to think of psychological insight as a sort of divine justice that implacably forces an individual to become aware of even the darkest parts of his or her soul. This is why--by refusing to 'conform to truth, fact, or reason'--the left, for all their babbling about "social justice", haven't a clue about the real meaning of the word; for all their claims of being "reality-based", they are living in a delusion; and for all their self-serving preening about being "compassionate and caring", they are exactly the opposite. CARNIVAL OF THE INSANITIES - Happy New Year ! THE SANITY SQUAD- Ready or Not, Here We Come ! A SATURDAY MORNING TOUCH AND GO ! BEHOLD THE LORD HIGH EXECUTIONER !